We live in an environment where everyday decisions, regardless of their size or impact, are largely based on the almighty Internet. From an organizational standpoint, rapid online expansion has affected almost every single layer, making it difficult to keep up with every development and stay ahead of the curve. Traditional training methods are no exception, being heavily affected by the digital movement. There is less of face-to-face interaction between a trainer and trainees as everything is moving online. Heck, you can get personal, step-by-step lessons via Skype and similar on how to shred the guitar, workout, cook - everything. And that is just on the leisure side of things. In the business sense, this is perhaps even more advanced (even if slightly underreported) due to often seismic market and customer shifts and trends. When such instances happen, online training comes as a logical step for businesses to provide training to the workforce before they actually need it. Given the fast-paced nature of these changes, they need it sooner rather than later. Online training has a slight issue of being more of the same in a different form. A slideshow with high-quality graphics and neatly organized text is the same old thing you witness live in a training room. Whether you go through it with a click of a mouse, a swipe of your finger, or if someone is handling the presentation itself, the end result is the same - often an uninspiring one. Clicking the 'Next' button to get to the end of the course is not stimulating. In fact, it's close to arbitrary. Modern ways of training focus on one key facet: engagement. The more engaging the training is, the likely it is to be fully absorbed. Delivering a technology-based form of training relies much on how perceptive the learner is. The need to centralize the experience in a single system is evident and has the potential to maximize effectiveness, as well as reduce common pain points such as the burden of receiving and understanding the content properly. The added benefit of such a platform is the higher rate of absorbed content, ensuring its better understanding. In that regard, engaging assessment styles can help evaluate the preferred way of processing information, whether it's auditory, visual, or tactile. Following this template, organizations can develop strategies which will improve learning potential in the long run. In this case, learner control has a particularly important role here, as a learner can control the speed of the lesson and progress at their own pace, instead of that of the trainer or fellow colleagues. Then, there are short bursts of training - brief learning experiences on important topics that are delivered as needed. Research has shown that these more abbreviated lessons yield better results than long-duration courses, and represent a step forward toward larger efficiency. With short(er) attention spans a fairly common occurrence in today's world of fast movings and multitasking, the expectations for workers to sit through an hour-long (and longer) course become less realistic and attainable. The idea behind short bursts of training is to make new knowledge easily absorbed and retained, reducing cognitive strain and helping the processing of this information. Gamification is another example of an effective learning technique. This fast emerging use of game-related elements in non-game environments creates immersive learning experiences that can be used for various training needs. In the case of induction, onboarding, or compliance, you can take your existing content and turn it into an interactive online one. As the process is typically repeated on a yearly basis to ensure the workforce remains up to date on changes, you can edit the content and create as many courses for specific groups. Because there is arguably an element of fun attached to it, gamification has high levels of engagement due to a more relaxed, informal environment. The concept easily captures workers' attention and accelerates their knowledge retention. As a rule of thumb, any technology with high population penetration demands a closer look with the aim of leveraging it. Undoubtedly, mobile plays a huge part in today's organizational advances, but also challenges. It's not just about a new generation of workers that prefer mobile technology as their modus operandi. It's that they favor truncated formats and readily-available training any time, any place. Being a resource available 24/7 to everyone, mobile learning is more of a necessity than anything else. Almost two-thirds of learners find accessing training content from a mobile device essential. By relying on in-office learning (the equivalent of desktop devices, in this case), companies falsely assume that their training caters to the needs of every employee, even if it is one of the online variety. The 'one size fits all' approach fails to take into account the flexibility and convenience of learning on the go, not to mention the ability to create a dedicated mobile app that's specific to an individual organization. Mobile training facilitates training on smaller screens, so the on-demand access to information may be less conventional. However, it is more empowering, as the availability at the worker's point-of-need improves engagement and interaction. In addition, through the use of mobile-responsive courses and a powerful online training platform, it's easy to implement mobile-ready training to smartphones and tablets via an app with the ability to fully personalize everything. The majority of vital organizational training challenges are tied to the more traditional and conventional ways. Businesses that face these obstacles must quickly adapt to modern times. Today, there's very little tolerance for lengthy, going-through-the-motions training that causes information overload (at best), instead of a favorable return on investment. No more instructor-led training sessions. The pressure is on to devise and deliver a custom learning strategy that puts your organization in control and allows you to train the way you want. By all accounts, such strategy demands engaging and effective training solutions that will keep the workforce up to date with the constantly changing business circumstances. In particular, one that caters to the new breed of tech-savvy workers. It's what both sides deserve. What happens if you don't induct someone? When a contractor, visitor or employee hasn't done an induction, and they start working on site, you risk that they are involved in a safety incident and haven't been properly made aware of hazards, procedures and other important areas that could have prevented the incident from happening in the first place. This could lead to liability issues for the organisation. An induction is the first step to ensure that all staff and visitors know what to do in an emergecy, that they understand fully their safety obligations and will comply with important HR and safety policies and procedures. 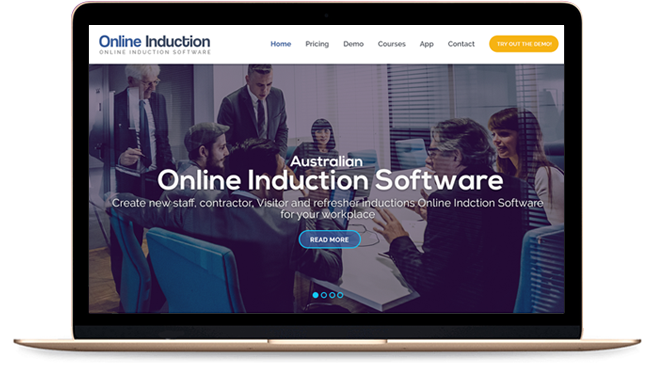 Online Induction Software is the tool to do this so that staff can complete these areas before they arrive at the workplace.